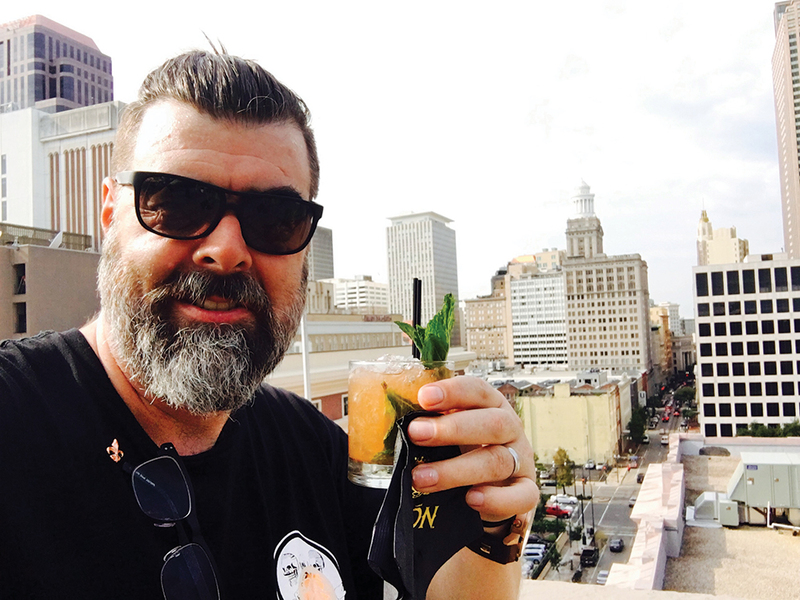 July 2016, I travelled to New Orleans to make my bi-annual pilgrimage to the World’s biggest cocktail and spirits event that is Tales of the Cocktail. Held every year during a week in late July, it is the assembly point around which the US bar industry now rallies. Every year it seems that whilst the world gets a little bit smaller, Tales gets a little bit bigger; this year lasting for six days, if you count the Tuesday arrival pre-welcome party through to the Sunday recovery at Bacchanal for a Rose-sippin’ wind-down. This year I got to travel with my good mate and Black Pearl bartending legend Nathan Beasley. For the uninitiated, Tales is a once a year opportunity for the influencers of the World’s Best Bars to come together, to pay respect where it is due, to mutually acknowledge greatness in our midst, to be seen by and rub shoulders with our peers – the cocktail glitterati and to re-affirm that the current movement in drinks and cocktails right now is about the hand-crafted and the bespoke, using seasonal, local and foraged ingredients, fortified with high quality and unique spirits, aperitifs, liqueurs and bitters. Tales is also about the Spirited Awards, one of the most sought after awards in the drinks and bar business today, battled across national and international lines. Tales represents the opportunity for the big players in the US liquor industry, in the biggest on-premise market in the world, to further ‘inspire and excite’ their fans through big-budget and mind-blowing parties and events and this year the torch bearers in this space – Pernod Ricard, Bacardi Martini, William Grant & Sons and Diageo, upped the ante with exceptional executions that were a feast for the senses. Tales is also the opportunity for hundreds of smaller brands to vie for a little bit more of your attention by slowly building their fan base with growing presence and larger activations. Great to see brands like Amaro Montenegro, Pernod Absinthe, St. Germain, Diplomatico, Altos, Suze, Fortaleeza, Lillet, and The 86 Co just to name a few, activating with growing scale. By being there, engaging with bartenders and showcasing the way their products should be best enjoyed by consumers, these brands will continue to grow. There are also hundreds of new spirits on offer to taste in the tasting rooms, as the ‘craft distilling’ movement approaches top gear in the US. Things kicked off on the Tuesday night this year with the annual Jameson Live Party, welcoming folks to Tales with Irish whiskey cocktails, neighborhood food and special guests – which turned out to be the New Orleans flavoured brass band Hot 8. The band warmed things up for none-other than Gary Clark Jnr, who proceeded to wail away on the guitar in a transcendent series of lead breaks that kept elevating the moment and culminated in people picking their jaws up off the ground and having more whiskey. The guy is just a phenomenon and the comparisons to Hendrix are legit when you’re watching from a few feet away! As usual Jameson delivered a Tales music and whiskey experience to remember. From there I went straight into the Tasting Room for agave spirits. Sampling artisanal mezcal in the morning can be a truly liberating experience and one that is sure to set the day off on the right foot! There is a continuing rise in awareness about agave spirits with mezcal leading the charge when it comes to wild harvested agave, artisanal and ancestral spirits and sustainability now a part of the conversation. The Wahaka Vino de Mezcal series is one brand shining a light on the dilemma facing the category. Tales founder, Ann Tuennerman always give a small welcome speech on the steps of the Monteleone (as is the tradition from the first Tales in 2002) and this year it was announced that ‘Tales On Tour’ will take place in Edinburgh in 2017. It’s always good to pick out a couple of seminars to get tickets for on the Wednesday or Thursday. (Of course this needs to be months in advance, as the most interesting sounding sessions sell out and the presenters will be more presentable early in the week). I popped into the ‘BIG GIN, Small Gin’ session to see ‘Aussie’ expats Mikey Enright and Raj Nagra breaking down the myths and perceptions that a big brand = bad and small brand = everything that’s good in the world, when this is not always the case. There are many good examples of how the big distillers can get it right and produce a great tasting spirit. Wednesday evening is the night for the official welcome parties with Pernod Ricard and William Grant & Sons sharing the night. Absolut kicked off first with the Midsummer White Party, at the new Ace Hotel, bringing a slightly whimsical take on a night inspired by wild Sweden with mythical creatures lurking and delicious libations. The night got rolling quickly with a selection of fresh cocktails made by some of the best bartenders from around the world, each with their own signature creation for Absolut. Onto the William Grant & Sons party and the whacky antics of the ‘Party on Your Palate’ crew were in full swing with Monkey Shoulder and Hendrick’s shenanigans being aptly personified by another two ‘Aussie’ expats in the form of Dean Callan and Sebastien Derbomez. Thursday usually opens to a few dusty cobwebs needing to be cleared out from the night before and thankfully there was an oasis for this purpose in the form of the Dante pop-up, Café de l’Aperitif, in association with Martini & Rossi and St. Germain. It became the place to grab a morning coffee, and a Negroni Sbagliato, which was all that was needed to get another day off to a great start. Great to see more ‘Aussie’ expats in the form of Naren Young, Linden Pride and Will Oxenham ‘killing it’ with Café Dante NYC. In the humid heat of a New Orleans afternoon the Altos Street Fair kicked off in the heart of the French Quarter off Bourbon St. The event is really just another excuse to eat tasty Mexican cuisine and sip on Altos signature cocktails made by some of the bartending greats of the moment! Always good to catch up with old friends and colleagues, but a highlight was the presence of Maestro Tequilero – Jesus Hernandez who was dishing out tastings of the newly released Altos Añejo. Thursday night included a dinner at the famous Cochon restaurant to fortify our mind and spirit with three pounds of porterhouse steak and some alligator in preparation for the Bacardi portfolio ‘Block Party’. It was a hugely decadent affair and effortlessly executed with Bacardi, Grey Goose, and Bombay each having their own ‘condo’. I eventually found a bar with all Bacardi spirits available to taste, including the new Havana Club rum made by Bacardi! Let’s just say you can tell it’s made by Bacardi. Back this year was the much-anticipated ELYX House, now in its fourth year at Tales and always provides a respite from the heat and humidity that is NOLA. In taking over a local metal working shop, Bevolo – ELYX transforms the space into ELYX House with a raw luxury and nostalgic feel with gilded metal and glass tables, velvet couches, exposed brick, bright neon and rough hewn wood, accented with more copper pieces than you can shake a cocktail at. Have you ever had a cocktail in a copper unicorn or a copper owl? It’s pretty cool. ELYX has further developed it’s connection with copper, ever since the copper pineapples were launched at Tales two years ago, by unveiling a new series of fanciful copper vessels – including gnomes, peacocks and swans. After losing nearly all pieces to ‘shrinkage’ in previous years, ELYX launched an in-house boutique where you could buy all the new copper vessels and bartending equipment that were being used by the bartending luminaries behind the bars. One of the features in ELYX House and a Tales highlight was the ‘A Little Bird Told Me’ cocktail session presented by Alex Kratena and Simone Caporale. These two legends of the London scene have been working with ELYX for a few years and presented a sensory degustation of cocktails matched with treats in a way that was natural, witty and layered with complementing and contrasting flavours inspired by nature in Sweden. It was right on the cutting-edge of where drinks and food are colliding in an evolving definition of what can be done to transfix the mind through the palate. 2016 was the 10th Anniversary of the Spirited Awards, which was presented in the ballroom at the Sheraton in front of about 1,200 of the world’s drinks and cocktail intelligentsia. It was a rollicking affair hosted by the irreverent and funny Simon Ford in his last year and joined by the good booze-loving Aisha Tyler. As the Awards, Champagne, and cask strength Lot 40 began to flow so too did the evening begin to unravel into what is a pretty debauched affair after three hours of back slapping joy. In the end it was London’s year with all the big international awards going to the UK. Another Tales highlight was being present for my friend and industry mentor, Max Warner, winning Best International Brand Ambassador for his commitment Chivas Brothers over the last twelve years, both for Chivas Regal and a five year stint on Plymouth Gin also. Chivas has long run the ‘green room’ behind the scenes at Tales and I remember four years ago serving ‘barrel aged cocktails’ with Max to the nominees and presenters as they got pampered before the awards. This backstage connection has grown over the last couple of years in to a full-blown photographic pop-up to capture the winners and presenters in a purpose built set, styled by Chivas and shot by the legendary New York photographer, Doron Gild. A stunning way to capture the moment! On a more sombre note, there was an incredibly moving tribute to New York bar legend, Sasha Petraske by his wife and friends, which reminded us of his legacy but also his humility in the way he lived his life. It was moment of clarity in a sea of self-adulation, but not overly so. Another Tales tradition is the ‘Bartender’s Breakfast’ after party event put on by Plymouth and Beefeater each year. This year we were treated to more awesome cocktails and a local crunk rock act, black lit in fluorescent paint and ‘active-wear’ showing us how to ‘no hand clap’ with your booty. As usual it was a classic ‘it only happens in NOLA’ moment. It was at this event that I finally saw Nathan again after a few days of just messaging each other! After the fifth day of partaking in copious amounts of food and drink, having more doesn’t seem like the logical thing to do. But as is tradition it’s worth the trip out to Bacchanal to recover with cheese platters and rosé wine. By late afternoon the place is packed with bartenders saying farewell and slowly but surely ghost-bombing just in time to make it onto their flights home. Me included. Ultimately, Tales means a lot of different things to a lot of different people and it is what you make of it. For a young bartender yet to travel, it’s definitely worth the effort to network with your peers and visit one of the great cocktail cities of the world! Tales is a valuable experience if you want to feel connected to the epicenter of the spirits and drinks industries. Hundreds of Australian bartenders have made the trip to Tales as a representatives of the Australian bar industry at large and have helped put our bartending skills on the map, as well as bringing back valuable insight for local benefit. For the seasoned vet it’s still got its relevance, although it’s less about learning and more about seeing, eating and drinking. PLAN YOUR TRIP EARLY – so you can maximize your schedule – but don’t try to do everything. VISIT ANOTHER CITY – Good to fly into LA or San Francisco for a couple of days on the way to New Orleans or New York or Miami after Tales. PACE YOURSELF – Tales is a marathon not a sprint. Best to ease into it without going to hard on the first night. EAT LIKE A KING – Sampling the local food is a must, especially the fried chicken. DRINK IN MODERATION – Though the temptation is there to over-indulge, you don’t need to finish every drink! THE NIGHT ENDS AT ALIBI – The dive bar to finish the night at and find your friends before the sun comes up!